Chicago, Illinois, USA. Tuesday 07/Wednesday 15-June-2016. 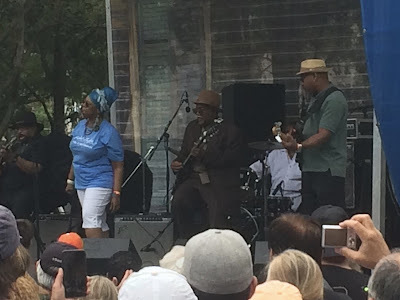 Mary had always wanted to go to Chicago for the Blues Festival so we scraped out the last of our airmiles and using our two-for-one Amex voucher booked two business class flights to the U.S. of A. We arrived Tuesday 7th which gave us several days to recover from jet lag and also do the tourist thing. Checked in and went for a beer at Schuba's Tavern (no live music as it was lunchtime) and later a pizza at Giordano's (pizza). We stayed a little North of the centre but close to a railway station so we could get in and out easily. Wednesday 8th was full on tourist stuff: Boat tour in the morning, city winery for lunch, bike ride in the afternoon, Jimmy Buffett's Margaritaville @ Navy Pier, then Joe's Seafood - #4 out of 7869 restaurants in Chicago according to TripAdvisor. The boat tour was an excellent architectural guide to the buildings along the waterfront by a very knowledgeable volunteer guide or "docent" as the American word is. Recommended. Thursday 9th. Frank Lloyd Wright centre and walk - as the son of an architect it was great to see so many buildings by a man I had known about from a very early age. Then River Roast for lunch, Sheffield Bar for early evening beer from a very knowledgeable and friendly barman, Mia Francesca for supper, Kingston Mines for late night music and more beer. Friday 10th. First day of the Blues Fest. In the morning we did the zoo. The food at the festival was very basic and expensive so we decided to stock up on lunch beforehand at Buddy Guys Legends blues club complete with live music. Afternoon and evening at the Blues fest starting with Siobhan Fahey formerly of Shakespears Sister. The brilliant Shemekia Copeland on the main stage. She was so good it prompted us to book for the Great British Rock and Blues Festival the following year where she was due to headline. All followed by a late night beer at Blackwood's Bar close to the hotel. Saturday 11th. The morning was a major, self-guided sculpture walk, see post Chicago 2016 statues. On the way to the festival I just had to stand at the start of Route 66. Again lunch and live music at Buddy Guys. One of the side stages. After the show we went back to the hotel for a nightcap at the nearby Cesar's Killer Margaritas on Clark. Sunday 12th. The morning was visiting a number of locations for the Blues Brothers, sightseeing more statutes and lunch at the highly recommended Purple Pig. Despite no booking they were able to squeeze us in as we were prepared to sit by the door. Jake: That's where they got that Picasso. The whole of the concert in the evening on the main stage was a tribute to Otis Rush. The man himself was there, now in a wheelchair, and was brought on stage to great applause. The fabulous signer (that is "signer" not "singer"). I was a bit surprised at first to see signing for the deaf at a music concert but why not. There were two of them who took it in turn. The dark haired guy seated was pretty restrained, he stood there and signed the lyrics real time. The blonde guy was really into the music, man he was grooving along. I didn't know you could sign with an accent but he was definitely camping it up - brilliant! Monday 13th. Flew XPR to LGA, transferred to JFK so we were close to our departure airport. That was a mistake in retrospect, we should have stayed in Manhattan. We managed to meet up with our friends Fred and Lynne for supper which was excellent. Tuesday 14th. Went in to NYC for a long stroll around Central Park. Then JFK - LHR and home arriving the next morning. Knackered but well pleased with the trip.